We were as surprised as anyone when Yota started dropping hints that a third handset was on the way from the Russian company - the YotaPhone 2 (shown above) was hardly an unqualified success, with a cancelled rollout in the US and refunds aplenty. 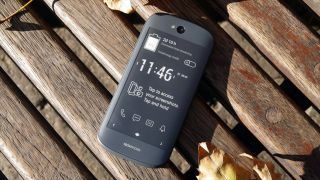 Well, it turns out the YotaPhone 3 is now official, based on noises made by its maker at a trade show in China. We don't have many details on the handset for the time being, but sources at the expo are reporting that a 64GB model will sell in the region of $350 (around £275), with a 128GB option for $450 (£350). Like its predecessors, the YotaPhone 3 is going to have a full-color, standard phone display around the front and a second, low-power, grayscale e-ink display around the back. It's always been a neat idea - it's just difficult to pull off. The phone will ship in China in September, apparently, and in Russia some time after that. What we don't have at the moment is confirmation that the new handset is going to be available anywhere else, so don't pin all your hopes on this being your next smartphone just yet. Yota makes other handsets besides these eye-catching e-ink ones, but after the first YotaPhone, which felt very much like a prototype, the YotaPhone 2 also came across as a work in progress. Let's hope the third incarnation irons out a few of the problems. We'll have to wait and see what internal specs the YotaPhone 3 is rocking, and indeed what the device looks like. The handset was teased on Instagram back in April, with a dim image that seemed to show a camera and the usual volume and power/lock keys - if indeed the picture was of the YotaPhone 3.